The A's have signed seven minor league free agents and added four players to their 40-man roster: John Baker, Chris Mabeus, Jason Perry, and Jeremy Brown. Of these, Brown is the surprise -- the Moneyball star has been doing quite poorly, and I doubt he was in any danger of being picked even with 30 good at-bats in the AFL. Catcher not being an organizational depth problem, I thought they would add another pitcher or something. They could afford to lose Brown, and are unlikely to do so anyway. This morning I walked into the Dana St Roasting Company in Mountain View to get my usual, a single iced mocha and a bear claw. On a table was a sports page opened to about D5 and the headline read, "Zito is the one to go." My heart skipped a beat. I thought, "Oh no, they traded Zito." Turned out it was a Ray Ratto article in the SF Chronicle which suggested that Zito be the one traded. It is a conflict of interest for me to write here and also encourage the trading of Barry Zito, the most interesting player in baseball. But someday he will be gone. We all have finite lifespans and even shorter finite places of employment. Forever implies infinity and the human condition and infinity are mutually exclusive. I didn't name this blog, but I think its title is relevant and beautiful. My writing doesn't do justice to the greatness of the name. Last friday night 5 other friends and I met at the Connecticut Yankee in San Francisco and ate and drank and talked baseball for about 3 hours. Mid November, spring traing still a long way away, and we talked of almost nothing else. Who do the A's need? Who will move on the Red Sox? How much does Pedro have left? How good is Barry Bonds? Should the A's move one of the big 3...these were some of the topics. The unstated understanding was that baseball is great and it is a small tragedy when that last out of the WS is made and we have to wait for next year. I am making a case to keep the big 3 intact. One more year, if we can't work out something with Hudson, let him walk at the end of 2005. Players have walked before and the team has been able to survive and compete on a modest budget. The farm system has been fruitful. It appears there are plenty of young A's farmhands to fill in the gaps. 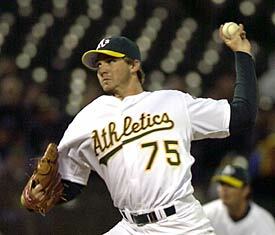 What I think the A's need is about 2 arms for the pen and 2 bats. If those bats come with some good gloves and arms, all the better. Over at Elephants in Oakland they called 2004 a "nightmare". Well if it was a nightmare it was one where if the A's can hold a 4-2 lead for Zito on the 2nd to last day of the season, they make the playoffs. I can think of nightmares much worse. Adam Miller over at athletics.scout.com has put together a very informative draft report for the A's 2004 draft. Go check it out. In other news, A's prospects are continuing to light up the Arizona Fall League. Huston Street recently gave up his second run of the season, but still leads the league with a 0.98 ERA and 7 saves. Omar Quintanilla is still among the league leaders in batting with a .386/.417/.545 line. And both catchers are doing well--John Baker is up to .293/.388/.390 after a very slow start, and Jeremy Brown has pummeled the ball to the tune of .333/.465/.606 in limited playing time (Brown is on the "taxi" squad, meaning he only plays twice a week). Apparently Nick Swisher played all of last year with an injured thumb, which he just had surgery on. He expects to be recovered "long before spring training." Then, after attending the team's baseball camp for kids, he decided to join the kids at their sleepover at Raley Field. How cool is that?! So far, the free agents are getting some pretty wacky contracts. The beginning was Omar Vizquel, 3 years 12 mil for a 37-year-old shortstop. Then Cory Lidle, a replacement-level pitcher if ever there was one, got 2 years, 6 mil. Today Vinny Castilla signed for 2 years, 6 mil, and Christian Guzman got 4 years, 16 mil. This is good news for the A's, who are unlikely to sign any competed-for free agents anyway. Why is this good news? Well, first of all, it means they can probably offer Miller and Hammond arbitration, counting on the market to beat the arb offer. (Dye and Mecir, probably not so much.) Second of all, if this is what replacement-level to average players are going for, maybe the A's can get out from under the Rhodes and Redman contracts without too much difficulty. Not that I think the A's should trade Redman, but I assume Billy is at least trying to. It probably also increases the value of all the other A's, since apparently it is expensive to get their free agent equivalents. It may not end up making a difference, but these contracts are a good sign for the A's offseason.